Here's a file that will open in Google Earth so you can follow us on our trip to Quebec on July 1. Once it opens, click on the file, then click on the 'Play Tour' button. BTW the new version of GE is even better. Remember the good old days when you tried to teach your kids what was good for them and what to avoid? Don't eat too much junk food, drink your milk, wear sunscreen. Somehow, that's all changed. Now they seem to know what's best for us. Vegetables without pesticides, pans without teflon and coke without aspartame - the tables have turned. Maybe, just maybe, we taught them too much. . .and too well! Found this beside the printer at one of the schools where I work. 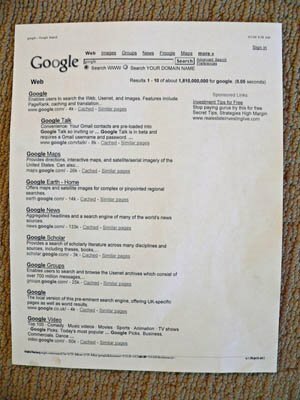 If you need to find something on Google how do you find Google? Well, you can always search for it. Then you can print off the results. This might fall under the category of incorrectly assuming students know proper search techniques. I'd bet that half the students in elementary school think that Google has a tremendous amount of information and when you ask them about their internet sources they invariably answer Google. They're quite shocked when I tell them that Google actually has no information even if they do have almost 2 billion results when you search for Google.